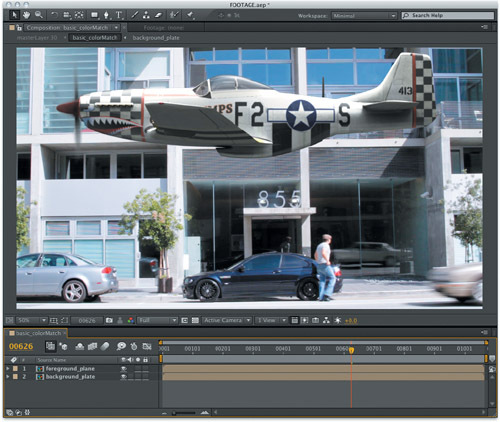 Now, having laid the groundwork with the toolset, it’s time for the bread-and-butter work of compositing: to match separate foreground and background elements so that the scene appears to have been shot all together, at once. You can learn this skill and produce measurable, objective results. The process obeys such strict rules that you can do it without an experienced eye for color. You can satisfactorily complete a shot on a monitor that is nowhere near correctly calibrated, and the result would not even suffer from color-blindness on your part. It’s simply a question of breaking down the problem. In this case, the job of matching one image to another obeys rules that can be observed channel by channel, independent of the final, full-color result. Of course, compositing goes beyond simply matching color values; in many cases that is only the first step. Observation of nature plays a part. And even with correctly matched colors, any flaws in edge interpretation , a procedural matte , lighting , camera view, or motion can sink an otherwise successful shot. These same basic techniques can also be used to match clips from a source precisely—for example, color correcting a sequence to match a hero shot (usually based on facial skin tones and other essentials), a process also sometimes known as color timing. Match overall contrast without regard to color, using Levels (and likely examining only the Green channel). Align the black and white points, with any necessary adjustments for variations in atmospheric conditions. Next, study each color channel individually as a grayscale image and use Levels to match the contrast of each channel. Align midtones (gamma), also channel by channel, using Levels or Curves. This is sometimes known as gray matching and is easiest when foreground and background contain areas that are something like a colorless midgray. Evaluate the overall result for other factors influencing the integration of image elements—lighting direction, atmospheric conditions, perspective, and grain or other ambient movement. Here you get to work a bit more subjectively, even artistically. This uncomplicated approach propels you to make adjustments your brain doesn’t necessarily understand because of its habit of stereotyping based on assumptions. An image that “looks green” may have a good deal of blue in the shadows but yellowish highlights, but a less experienced eye might not see these (and even a veteran can miss them). The choices are bolder than those derived from noodling around, and the results can be stunning (as we’ll see on a subtle example here, followed by a couple of radical ones thereafter). Truthfully, even an experienced artist can be completely fooled by the apparent subjectivity of color because of how human vision works. Figure 1 shows an example in which seeing is most definitely not believing. Far from some sort of crutch or nerdy detail, channel-by-channel analysis of an image provides fundamental information as to whether a color match is within objective range of what the eye can accept. Figure 1. There are no yellow dots in the image at left, and no blue dots in the middle image; the four dots shown in the image at right are identical to their counterparts in the other two images. We begin with a simple example: comp a neutrally lit 3D element into an ordinary exterior day-lit scene. Figure 2 shows a simple A over B result in which the two layers are close enough in color range that a lazy or hurried compositor might be tempted to leave it as is, other than adding a bit of motion blur to match the car entering the frame. For an inexperienced comper, this shot is a bit of a challenge, as it may be difficult with the naked eye to say exactly how or why the color doesn’t match. Figure 2. An unadjusted foreground layer (the plane) over a day-lit background. To begin, make certain that you are working in 16-bpc mode (Alt- or Opt-click on the indicator at the bottom of the Project panel to toggle). This prevents banding and enhances accuracy when adjusting color of low-dynamic-range images. Now reveal the Info panel, and choose Decimal (0.0 - 1.0) under the panel menu at the upper right to align with the settings used in this section. If you like, tear off the Info panel by Ctrl-dragging (Cmd-dragging) it over the Composition viewer. This particular background plate helps us a lot, as it’s filled with monochromatic elements: a concrete landscape and a silver car, black shadows and car tires, little white details such as a sign, license plate, reverse lights, and the stripe of a loading zone. The foreground aircraft is also predominantly monochromatic, with many black details and white highlights. The first step is to match overall contrast with the Levels effect, so apply that to the foreground layer. This adjustment can be performed while viewing regular RGB but it may be easier with only the green channel displayed (Alt+2/Opt+2, or select from the menu). Move the cursor over the highlight areas along the top of the plane (or just look at the Levels histogram) and you’ll notice that some of the highlights are clipped to 1.00 on all three color channels, as are highlights. Clipping is part of life and not necessarily a bad thing unless those highlights need to be recovered for some reason; in this case, let’s suppose we don’t need to worry about Levels and just want to match the clipped foreground to the clipped background. Here, the white foreground contrast doesn’t appear hot enough for the outdoor lighting of the background. Even the road surface blacktop is close to pure white in the direct sunlight, so clearly the highlights on the plane should, if anything, be pushed further. Lower Input White to at least the top of the visible histogram, around 0.82 (Figure 3). Figure 3. Just because the Info panel and histogram clearly indicate clipping in the foreground doesn’t mean you can’t clip highlights further if it helps properly match it to the background. Shadows appear to match reasonably well on the green channel. Black contrast areas, the shadows, are at least as subjective. Again the histogram indicates that some blacks are already clipped; the question is whether the shadows, for example, under the back wing, need to be deeper (or lighter). Move the cursor to the shadows underneath the cars and they are clearly deeper—as low as 0.04. But higher up on the building, reflected light from the surface lightens the shadows under the overhangs to something like we see under the wings, in the range between 0.2 and 0.3 on all channels. Subjectively, you can try raising Output Black slightly to get more of the effect of shadows lightened by reflected light, or you can crush the shadows more with Input Black to match those under the cars. Try each before leaving them close to neutral. Having aligned contrast, it’s time to balance color by aligning contrast on each channel. Move your cursor back over shadow areas and notice that although the foreground plane’s shadows are neutral, the background shadows are approximately 20% more intense in the blues than greens, and around 20% less intense in red versus green. The goal is not so much to match the blacks to the exact levels of the background as to match these proportions on the red and blue channels. Place the cursor under the big plane wing and notice that the green value of that shadow is around 0.2. Switch Levels to Red under the Channel menu and raise Red Input Black just a hint, to something like 0.025, until the red value under the wing is approximately 0.18, or 20% lower than green. Now switch Levels to Blue; this time you’ll raise Blue Output Black to lift the darkest blue shades slightly (maybe even just 0.015, Figure 4). Double-check with your cursor under the wing; the red, green, and blue proportions are now similar to those of the background blacks. Figure 4. Black levels for Red and Blue in the foreground are taken just a hint in opposite directions, raising the effective black level in blue and lowering it in red (left). These adjustments are a little too subtle in this case to perform with the naked eye, so they were arrived upon using values shown in the Info panel. Now for the whites. 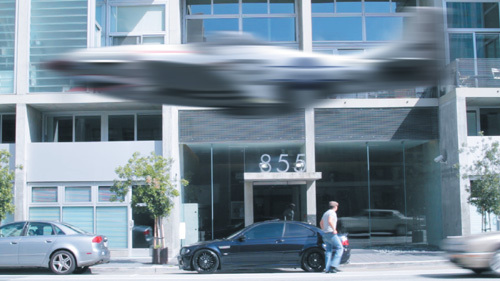 Take a look at the RGB image again, and notice the silver car left of frame and the difference between it and the plane. It’s not clear that they should be the exact same shade, but let’s assume that they are both neutral gray and should be made much more similar, which can be accomplished by adjusting just white contrast on all three channels. Starting with the Blue channel, notice that the plane looks a little dull overall compared with the car. Bring Blue Input White down to at least 0.95 while viewing the blue channel (Alt+3/Opt+3) and see if it doesn’t appear to be a better match. Switch the view and Levels control to Red, and notice that, conversely, the side of the plane looks bright compared to the car. Bring Red Output White down about the same amount, to 0.95. A final look at green shows that the same adjustment there, of Green Output White to 0.95, helps the match. Notice that these edits influence not just the highlights, but also midtones, so there’s no need to adjust gamma directly. Et voilá, back to RGB—you’ll see the result, which you can compare with the source image from Figure 5.26 simply by toggling Levels, in Figure 5. Motion blur can be roughed in by adding Fast Blur, setting Blur Dimensions to Horizontal, and raising Blurriness to approximately 100.0 to match the car entering frame right. The plane is now more effectively integrated into the scene, and these subtle changes make a huge difference (toggle the before and after to see for yourself). Figure 5. Compare this integration to that of Figure 5.26.